0 Comments Published by Jane on Friday, February 13, 2009 at 5:14 PM. 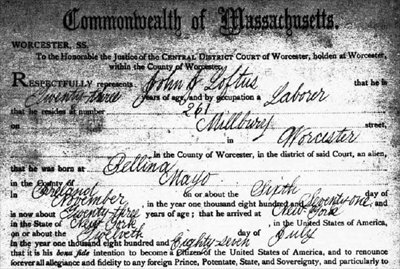 My Great-Grandmother, Mary Loftus McDonough, had a brother named John Loftus who immigrated just as she did to Worcester, Massachusetts. Previously, I had found Mary's younger brother's naturalization document which established that he was born in Bradford, Yorkshire County, England. Mary was also born in England, likely also in Bradford. But Mary's parents are not originally from England. They were both born in Ireland. Where in Ireland has been the question. To the honorable the Justice of the Central District Court of Worcester, holden at Worcester, within the County of Worcester, Respectfully represents John J. Loftus that he is Twenty-three years of age, and by occupation a Laborer that he resides at number 261 on Millbury street, in Worcester in the County of Worcester, in the district of said Court, an alien that he was born at Bellina in the County of Mayo in Ireland on or about the sixth day of November, in the year one thousand eight hundred and seventy-one, and is now about Twenty-three years of age; that he arrived at New York in the state of New York, in the United States of America on or about the Twelveth day of July in the year one thousand eight hundred and eighty-seven that it is his bona fide intention to become a Citizen of the United States of America, and to renounce forever all allegiance and fidelity to any foreign Prince, Potentate, State, and Sovereignty and particularly to Victoria, Queen of the United Kingdom of Great Britain and Ireland, whose subject he has heretofore been; that such has been his bona fide intention for two years last past and that he was a minor at the time he arrived in the United States and resided therein three years next preceeding his arrival at the age of twenty-one years. And that he has resided in the United States five years last past. Could this be Mary's brother John Loftus? If it is, then we finally know where the family originated in Ireland - Ballina, County Mayo, Ireland.